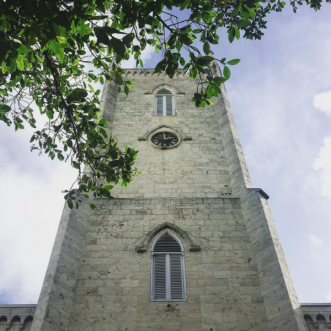 Should there ever be another James Bond movie to join the ranks of Thunderball, Never Say Never Again, or Casino Royale – which were all filmed on location in The Bahamas – I vote the opening sequence be similar to that of the below. However staying true to the first few frames of the spy films, in the scene of a high-speed chase with a villain in sight. Weaving through the start of some 150 inlets and cays that we will pass while on our 130-mile journey that day, Captain Raymond Lightbourn of Exuma Water Sports navigates with the skillful hand of a man who knows the many varying depths of Exumas’ surrounding waters. Waters which have held many of captains victim with her ever changing tides, hidden sandbanks and protruding shoals. Raymond looks to the sea as an open highway, knowing that it takes its color from the bottom and that such colors serve as a compass. 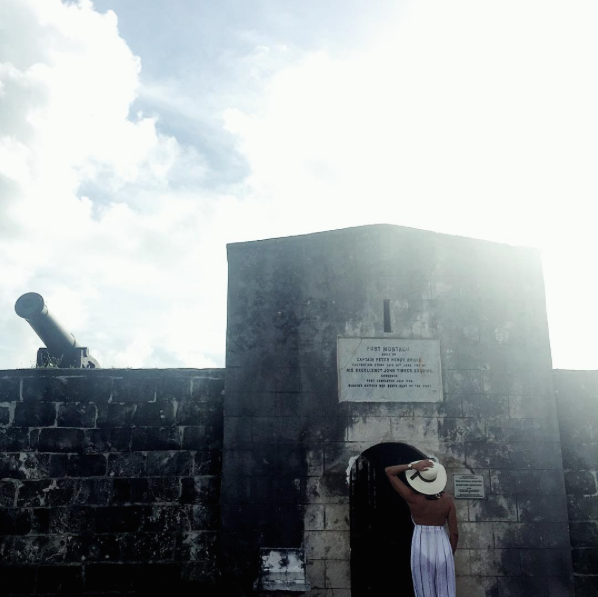 The experience is an exhilarating one for myself and the 16 on-board passengers as the boat narrowly kisses honeycomb limestone and footprint-free beaches – several of which lead to the celebrities homes of David Copperfield, Nicholas Cage, Johnny Depp, and Faith Hill & Tim McGraw. Noting my appreciation for the thrill, he yells over the whipping wind that it’s the 36ft off-shore powerboat which allows him such freedom. Explaining that when idle she draws two and a half feet but in full throttle she draws as little as ten inches. He eases on the throttle and goes on to say that with the introduction of Google Maps boating in The Bahamas forever changed. 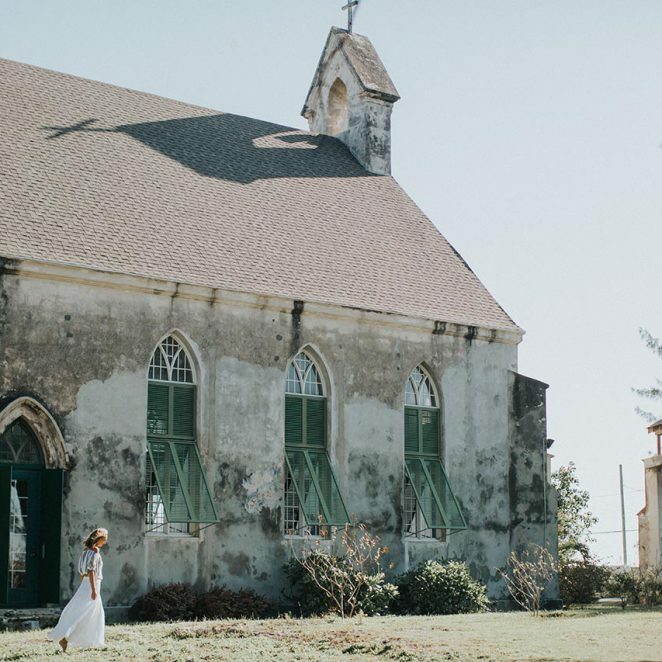 Needless to say it also lent to finding the ideal location for The Musician, a sculpture commissioned by nearby private island owner David Copperfield and our first of nine stops that day. Diving in we discover a mere four meters below the art of sculpturor Jason deCaires Taylor, a location worthy of being featured in the original series of James Bond novels by writer Ian Fleming. As we swim against strong currents I imagine Bond spotting his oncoming villain in the reflection of the mermaid’s mirror finished Steinway Concert Grand and an underwater fight scene taking place. Naturally I think to Thunderball Cave also known as “James Bond Cave” or “Golden Grotto” – the battlegrounds of the infamous underwater fight between Bond and a small army under the rule of his arch nemesis, eye-patch wearing Largo. 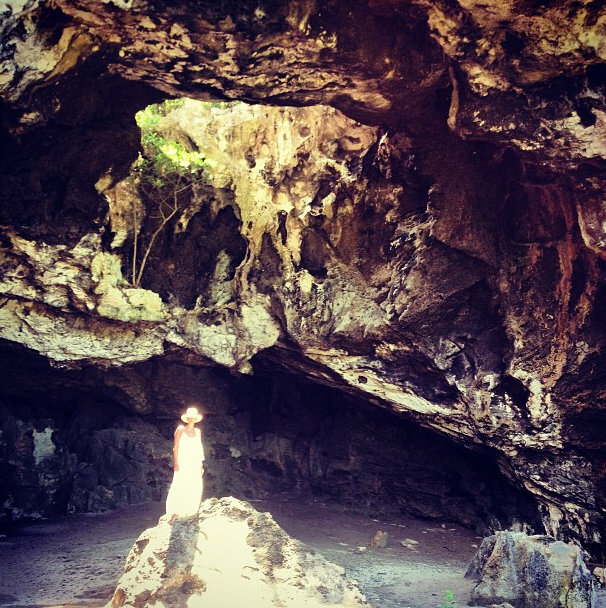 A cave we will later explore after a quick stop at the nearby sandbar of Musha Cay. A cave that has had me in nerves since the day before. Anchoring on the outskirts of Thunderball Cave, Raymond announces with the causality of a man born with gills, that one must dive under a submerged opening so as to reveal a hidden cavern. Although it’s a dive I have done countless times before, I find my nerves are darting like a fish trying to escape its prey. A feeling now mirrored by my fellow boat passengers. Nevertheless, it’s at the mention of fear over confined spaces that I describe the pool of light which spills through the cave’s ceiling – and with such a vote of confidence I dive in to the crystal clear waters. My nerves are immediately washed away as they are replaced with a sense of wonder, excitement and curiosity. In little time the length of my body skims the ocean’s floor and with outstretched hands I am darting in and out of four caves openings. Once again on board we continue on to nearby Staniel Cay Yatch Club where the Thunderball film crew stayed and often frequented. On the menu the highly recommended fresh catch of the day: Mahi Mahi, and the soon to be leftovers of a Conch Po’Boy and Lobster Salad – of which we would later feed to the swimming pigs of Big Major Cay. Continuing north we are bound for Compass Cay, a marina where in waist deep water twenty plus nurse-sharks and countless bonefish swim about us as Raymond throws chopped bait from the above dock. At first I am hesitant to let the water pool around me, as are most, but it’s my innate fear of missing out which propels me down a seaside ladder and has my hand reaching out to feel the leather like skin of one nurse shark after another. Back on board I think to how the island-scape of 365 cays calls for one to live beyond the comfort of their day-to- day norm. For where else in the world, among a 130 mile long chain, can you swim among mermaids, touch nurse sharks, dive cinematic caves or feed iguanas as we later did? Nowhere. Of this I am certain. Especially not all in one day without Raymond at the helm and Exuma Watersports lining the side of the boat. From top to bottom. Left to Right. 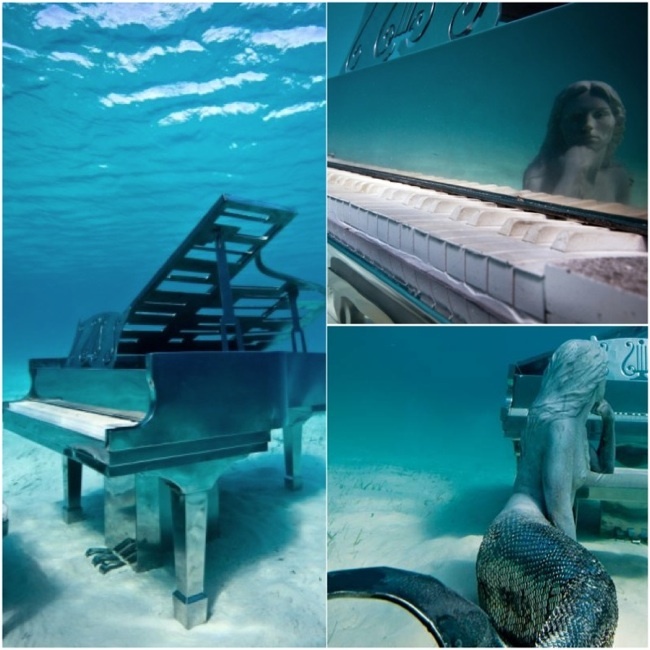 Photographs of The Musician from Jason deCaires Taylor and Robb Report. 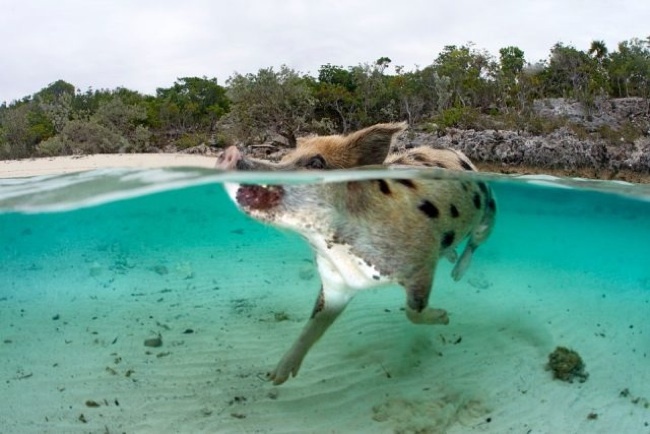 Swimming Pig, photographed by Kip Evans. 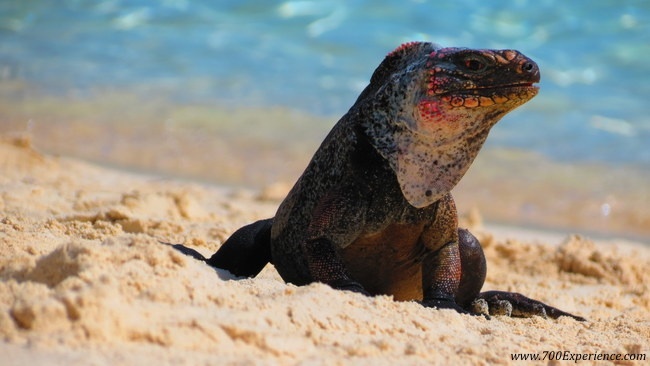 Iguana, photographed by Christopher Ansell. Disclosure: I received a complimentary tour from Exuma Water Sports. As always, all thoughts and opinions are my own.